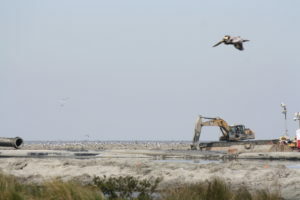 An artificial berm was created on the bay-side of this island and then new substrate was piped in to add sediment- in time plants such as mangroves will colonize the new soil and a marsh will develop. Given the wide ranging issues facing wetlands around the world, it’s nice to know that we also have a wide range of ways to get involved in protecting these important habitats. Hopefully you find something that sparks your interest- if not, this may be your opportunity to start something new! Vrtiska, M.P., J.H. Gammonley, L.W. Naylor, and A.H. Raedeke. 2013. Economic and conservation ramifications from the decline of waterfowl hunters. Wildlife Society Bulletin 37:380–388.